Super Hero Boy: While I wait for my real baby I can play with one on my DS! While I wait for my real baby I can play with one on my DS! 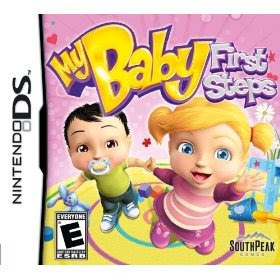 Who needs a doll when you can have your very own interactive baby on your Nintendo DS? My Baby First Steps is a interactive game where you love and care for a growing toddler. The only bonus is you don't have to spend every waking moment running after them and screaming jump/touch/fall on that. Phew, Wait I must be talking about my normal typical day. Actually up till now I've never played a sim game where I had to take care of an actual human. Dogs yes, farms yes, even strange little monsters who were quite demanding but there seems something awfully complicated about making a sim toddler. However, My Baby First Steps actually delivers! Sure it leaves out the whole being exhausted 24 hours a day part, which is all for the best, but you can teach your little electronic baby quite a few things. Depending on what your assigned to do for the week you have to do everything from teach your baby to walk, talk, and even give him or her baths and read to them. The game is much more challenging than I thought it would be, I felt a genuine sense of frustration trying to get my little electronic toddler to talk, far less than getting a real one to talk but certainly it wasn't just handed over. Not so much that the average elementary school kid would not be able to play but I was actually a little amused by the fact that it actually made a challenging game out of raising a child. Only if the kids knew how hard it really is!!! Some reading is required to play and complete challenges so I'd say it would be best for children 6+ or younger kids with above average reading levels. Overall its a really fun game, and a great addition to any sim game collection especially for younger girls. Adults will find it amusing as well and it uses just about all the aspects of the DS including the microphone during teaching the toddlers to talk. I think it falls a little too close to home at the moment for me, lol, with an almost three year old and a baby on the way I think I'll spend my time playing with my real ones. I have to admit though it would have been a really cool game to have had while I was waiting on the birth of my first baby! My Baby First Steps is available right now and you can pick up your copy on Amazon! Southpeak Games was gracious enough to send us a second copy to give away to one lucky reader! Leave a comment on this post. Just check out the Southpeak Games website and tell us which other game from their collection you'd love to play! This contest will end Feb 28th at midnight! I like Mister Slime! cdziuba@aol.com My email is easily seen in my profile. I am an E-mail subscriber, thanks! I would love to try out Fast Food Panic! I think my family and i would enjoy the pool party game for the Wii. we have My Baby which my girls love. I'd like to play the Roogoo Twisted Towers game for the Wii. Thanks.